Graco Inc. (NYSE:GGG), a leading manufacturer of fluid handling equipment, is pleased to launch the new and improved LineLazer® 3400, the industry’s best one-gun airless line striper, with upgrades that improve line accuracy, enable the use of productivity-increasing accessories and provide a better overall user experience. 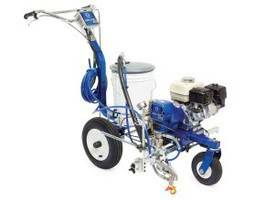 Mike Vangstad, Graco Global Product Marketing Manager for Pavement Maintenance Products, said, “We made the best one-gun airless striper even better by making improvements to the LineLazer 3400 chassis. With these improvements, users will benefit from straighter lines and improved ergonomics. Secondly, the upgraded LineLazer 3400 is compatible with more productivity-increasing accessories, allowing for greater customization." The LineLazer 3400 is a proven performer for professionals who want the highest-quality lines and now includes upgrades and improvements that enable a more productive, easier striping experience. In addition to a new frame compatible with the 15-gallon paint hopper and the EZ-bead system, the upgraded LineLazer 3400 features the EasyMark™ Spray Gun Adjustment System for accurate and repeatable gun adjustments. For all-day comfort and greater control, the LineLazer 3400’s improved chassis design includes a new contoured ergonomic handle bar system. Finally, the Electronic Pressure Control system delivers consistent spray pressure for excellent line quality while the EnduranceTM Paint Pump delivers the industry’s best pump life. To learn more about the upgraded Graco LineLazer 3400 and all LineLazer striping solutions, visit www.graco.com/LineLazer3400.